The ten members of the Judicial Performance Commission for the Twentieth Judicial District unanimously recommend that Chief Judge Maria E. Berkenkotter BE RETAINED. Judge Berkenkotter received her undergraduate degree from Western Michigan University. She obtained her law degree from the University of Denver in 1987. Thereafter, Judge Berkenkotter served as a clerk for Colorado Supreme Court Justice Howard M. Kirshbaum for one year. After spending two years in private practice, she then served in the Colorado Attorney General’s Office for 16 years, rising to a supervisory role in the Antitrust, Consumer Protection and Tobacco Litigation Unit. She was appointed as a District Court Judge in Boulder County in 2006. She was retained by Boulder County voters in 2008. In September 2013, Judge Berkenkotter was appointed by the Chief Justice of the Colorado Supreme Court to the position of Chief Judge for the Twentieth Judicial District. Our retention recommendation is based on responses to anonymous surveys sent to attorneys and non-attorneys that appeared in Judge Berkenkotter’s courtroom, a self-evaluation, unannounced visits to her courtroom, several written opinions, and an interview with Judge Berkenkotter. The commission also invited input from the citizens in a public hearing soliciting information about all the judges up for retention. Survey results for Judge Berkenkotter were very good, with an overall rating of 3.33 (out of 4) from the 96 attorneys who responded and 3.77 from 270 non-attorneys. Among attorneys, 87% recommended retention and 9% recommended non-retention, and 5% made no recommendation. Among non-attorneys, 97% recommended retention, and 2% recommended non-retention. (These percentages may not add up to 100% due to rounding.) Fifty-nine percent of attorneys reported that Judge Berkenkotter showed a slight biased in favor of the prosecution, while 39% reported that she was completely neutral. 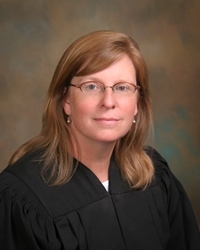 Judge Berkenkotter estimates that approximately 25% of her time is spent in civil proceedings, 35% on domestic relations issues, and 40% in criminal proceedings. As Chief Judge, she is also responsible for administrative management of the work of eight District Court judges and five County Court judges, other courthouse personnel, managing the physical space of the courthouse, and managing fiscal issues. Judge Berkenkotter reported, as an example of her work as Chief Judge, that her attendance was required at 150 meetings during the past year, over and above the time demands of her regular docket. Comments from both attorneys and non-attorneys indicate that Judge Berkenkotter is perceived to be hard-working, organized, and fair. Several survey respondents complimented Judge Berkenkotter on her judicial demeanor and her consistent respect for everyone in the courtroom. The Commission feels that we are fortunate to have such a skilled, hard-working, and compassionate Chief Judge in the Twentieth Judicial District.